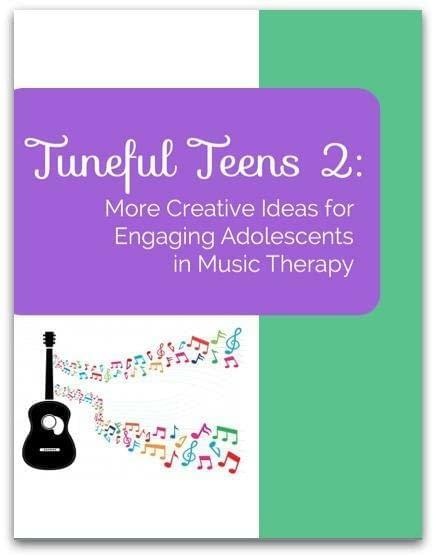 Tuneful Teens 2: More Creative Ideas for Engaging Adolescents in Music Therapy is packed with more ideas to get your creative juices flowing when session planning for teens with special needs. – Do you work with teens and often feel stumped when it comes to session planning? 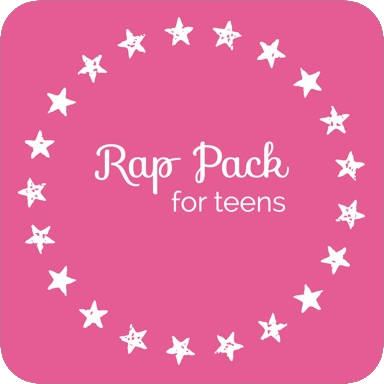 – Do you struggle to find appropriate pop songs to use in your sessions with teens? 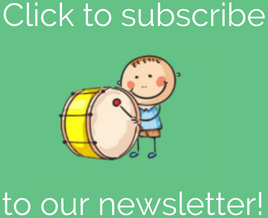 – Did you purchase Tuneful Teens 1 and wish you had access to even more creative ideas for engaging teens in your sessions? – Do you feel overwhelmed by learning new pop songs and creating new templates frequently in order to keep things fresh? If you answered YES to any of those questions, I can completely relate because I’ve been there too: feeling stuck for ideas, feeling like I’m doing the same activity over and over, struggling to engage the teens in my group. But, after twelve years of experience working with teens with autism and other special needs….twelve years of trying out a multitude of interventions…I have a TON of successful ideas that I just know you’re going to love! 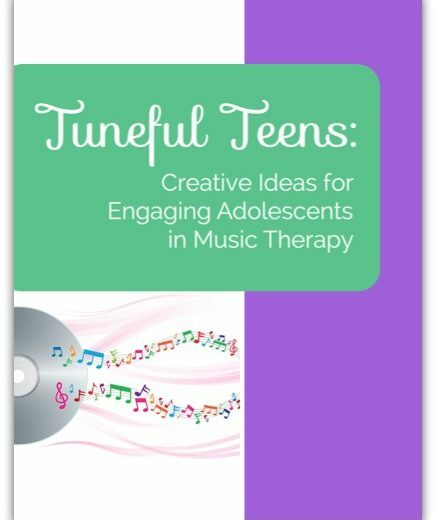 That’s why I created Tuneful Teens 2: More Ideas for Engaging Adolescents in Music Therapy. That is why I am SO excited about Tuneful Teens 2. 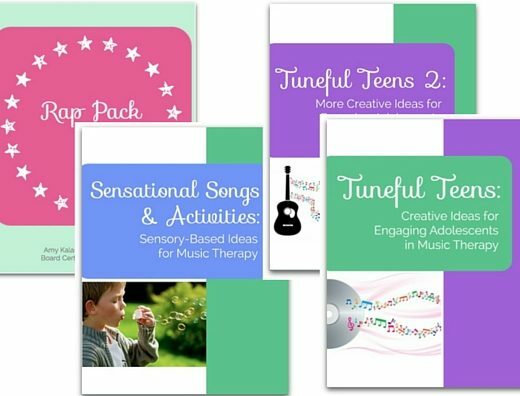 The Tuneful Teens 2 E-book is jam-packed with intervention ideas, song ideas, and templates for a variety of activities that are appropriate and engaging for teens with autism and other special needs. 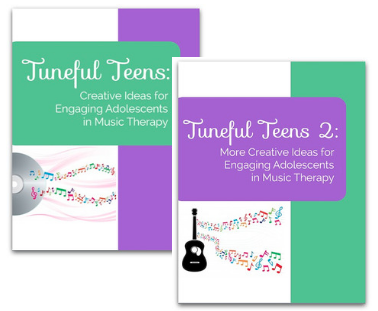 Every idea in Tuneful Teens 2 has been used multiple times in my music therapy sessions. I’ve included only the intervention ideas that have been most successful in meeting targeted goals and the most popular ones with the teens in my groups. I am SO excited to share these ideas so you can start implementing them right away. 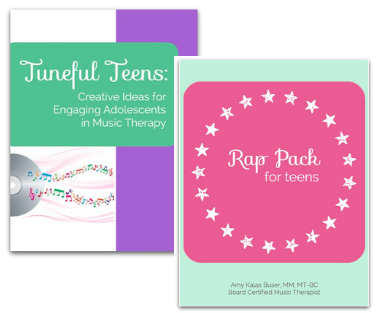 Tuneful Teens is your guide to navigating the world of music therapy with adolescents with special needs, and it’s only $18! Don’t need any more convincing? Click ‘Add to Cart’ to purchase. When your purchase is complete you’ll receive an email confirmation with a link to download your E-Book! (Or keep reading to find out more about the goodies you’ll find in Tuneful Teens 2). AND THAT’S JUST THE BEGINNING – I share many more tips, resources, and ideas in the 50 pages of Tuneful Teens 2. Each category lists specific intervention ideas, complete with goal areas, what you will need to prepare in advance, and steps of the procedure for easy implementation. BONUS…I’ve even included a Pop Song Hot List with 100 of the freshest, hottest songs (updated every six months!) You do NOT want to miss out on this! I want to save you time! So, I’ve include sheet music, lyric sheets, musical game templates, and everything you’ll need to implement these ideas into your sessions immediately. I want you to be successful! So, I’ve only included the intervention ideas that have been the most successful and most popular with my groups. I want YOU to feel confident so you can engage teens more effectively in your therapy sessions and build therapeutic rapport that is so crucial to helping these clients meet their goals. Don’t work with teens with special needs? No problemo – the ideas in Tuneful Teens 2 can easily be adapted for other teen populations (such as those with mental illness or emotional behavior disorders) and for adult populations. The best part? You can have all of this – over 50 pages of creative ideas, sheet music, and activity templates – all for only $18! “I would definitely recommend Tuneful Teens 2 to those working with teens, but I also find these activities would work well with some older children groups as well. I especially find the Greeting song “Come On and Get Ready” to be great to start my teens group. When working with teens you want an appropriate hello song and this one fits my older groups well. I also have used the Mad Lib songwriting activity with some of my teens and that is a lot of fun. Thanks for providing such a good resource! “I love how Tuneful Teens 1 & 2 are laid out with simple intervention instructions, prop samples, and follow up ideas. It makes it very easy to understand and helps me feel confident I could successfully implement the ideas with a group.Would I recommend Tuneful Teens 2? Absolutely! The intervention ideas are great! Marcia Humpal, M.Ed, MT-BC presented the greeting song Come On & Get Ready from Tuneful Teens 2 (sheet music is included in the E-Book!) during the Autism Spectrum Disorder CMTE at the 2014 American Music Therapy Conference in Louisville, KY.
Rachel Rambach listed Tuneful Teens as a Friday Fave on her blog Listen Learn Music! Check out her review and recommendation here.